Grimes described Chesna as a 42-year-old Iraq and Afghanistan war veteran who leaves behind a wife and two children, ages 4 and 9. WEYMOUTH, Mass. — A Massachusetts police officer and bystander died Sunday from wounds sustained when a suspect allegedly took the officer’s gun and fired following a vehicle crash and a foot chase. 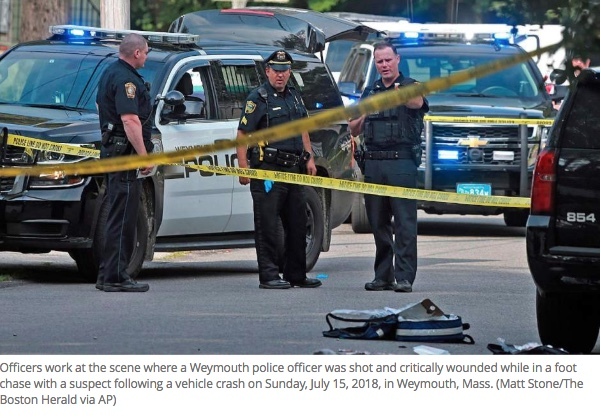 Authorities said Weymouth officer Michael Chesna was shot multiple times by his own fire arm before 8 a.m. Sunday, and died from the injures at South Shore Hospital. Officials said an unidentified elderly woman also died after being hit by stray bullets in a nearby home. Weymouth Police Chief Richard Grimes said the shooting suspect, Emmanuel Lopes, was in custody. No additional information about Lopes has been released.